In English, the battle is usually known as the "Marco Polo Bridge Incident". The Marco Polo Bridge is an eleven-arch granite bridge, an architecturally significant structure first erected under the Jin and later restored by the Kangxi Emperor in 1698. It gained its Western name from its appearance in Marco Polo's record of his travels. It is less often referred to as the "Battle of Marco Polo Bridge". It is also known as the "Lukouchiao", "Lugouqiao", or "Lugou Bridge Incident" from the local name of the bridge, derived from a former name of the Yongding River. This is the common name for the event in Japanese (盧溝橋事件, Rokōkyō Jiken) and is an alternate name for it in Chinese (t 盧溝橋事變, s 卢沟桥事变, p Lúgōuqiáo Shìbiàn) and Korean (노구교사건, Nogugyo Sageon). The same name is also expressed or translated as the "Battle of Lugou Bridge", "Lugouqiao", or "Lukouchiao". In China and Korea, it is more often known as the "July 7th Incident"
Tensions between the Empire of Japan and the Republic of China had been heightened since the Japanese invasion of Manchuria in 1931 and their subsequent creation of a puppet state, Manchukuo, with Puyi, the deposed Qing dynasty Emperor, as its head. Following the invasion, Japanese forces extended their control further into northern China, seeking to obtain raw materials and industrial capacity. A commission of enquiry from the League of Nations made a critical report into their actions, leading to Japan pulling out of the League. The Kuomintang (KMT) government of China refused to recognize Manchukuo, but did agree to a truce with Japan in 1933. Subsequently, there were various "incidents", or armed clashes of a limited nature, followed by a return to the uneasy peace. The significance of the Marco Polo Bridge Incident is that following it, tensions did not subside again; instead, there was escalation, with larger forces committed by both sides and fighting spreading to other parts of China. With hindsight this (small) incident can therefore be regarded as the starting point of the major conflict. By July 1937, Japan had expanded its forces in China to an estimated 7,000 to 15,000 men, mostly along the railways. This number of men, and the amount of concomitant matériel, was several times the size of the detachments deployed by the European powers, and greatly in excess of the limits set by the Boxer Protocol. By this time, the Imperial Japanese Army had already surrounded Beijing and Tianjin. On the night of 7 July, the Japanese units stationed at Fengtai crossed the border to conduct military exercises. Japanese and Chinese forces outside the town of Wanping—a walled town 16.4 km (10.2 mi) southwest of Beijing—exchanged fire at approximately 23:00. The exact cause of this incident remains unknown. When a Japanese soldier, Private Shimura Kikujiro, failed to return to his post, Chinese regimental commander Ji Xingwen (219th Regiment, 37th Division, 29th Route Army) received a message from the Japanese demanding permission to enter Wanping to search for the missing soldier. The Chinese refused. Although Private Shimura returned to his unit, by this point both sides were mobilising, with the Japanese deploying reinforcements and surrounding Wanping. Later in the night, a unit of Japanese infantry attempted to breach Wanping's walled defences and were repulsed. An ultimatum by the Japanese was issued two hours later. As a precautionary measure, Qin Dechun, the acting commander of the Chinese 29th Route Army, contacted the commander of the Chinese 37th Division, General Feng Zhian, ordering him to place his troops on heightened alert. At 02:00 in the morning (18:00 UTC) of 8 July, Qin Dechun, executive officer and acting commander of the Chinese 29th Route Army, sent Wang Lengzhai, mayor of Wanping, alone to the Japanese camp to conduct negotiations. However, this proved to be fruitless, and the Japanese insisted that they be admitted into the town to investigate the cause of the incident. At around 04:00 (20:00 UTC), reinforcements of both sides began to arrive. The Chinese also rushed an extra division of troops to the area. About an hour or so later the Chinese Army opened fire on the Japanese Army and attacked them at Marco Polo Bridge (210 metres [690 ft] west-southwest of Wanping), along with a modern railway bridge (334 metres [1,095 ft] north of the Marco Polo Bridge). At 04:45 (20:45 UTC) Wang Lengzhai had returned to Wanping, and on his way back he witnessed Japanese troops massing around the town. Within five minutes of Wang's return, the Chinese Army fired shots, thus marking the commencement of the Battle of Beiping-Tianjin, and, by extension, the full scale commencement of the Second Sino-Japanese War at 04:50 on 8 July 1937. Colonel Ji Xingwen led the Chinese defenses with about 100 men, with orders to hold the bridge at all costs. The Chinese were able to hold the bridge with the help of reinforcements, but suffered tremendous losses. At this point, the Japanese military and members of the Japanese Foreign Service began negotiations in Beijing with the Chinese Nationalist government. A verbal agreement with Chinese General Qin was reached, whereby an apology would be given by the Chinese to the Japanese; punishment would be dealt to those responsible; control of Wanping would be turned over to the Hopei Chinese civilian constabulary and not to the Chinese 219th Regiment; and the Chinese would attempt to better control "communists" in the area. This was agreed upon, though Japanese Garrison Infantry Brigade commander General Masakazu Kawabe initially rejected the truce and, against his superiors' orders, continued to shell Wanping for the next three hours, until prevailed upon to cease and to move his forces to the northeast. Although a ceasefire had been declared, further efforts to de-escalate the conflict failed, largely due to actions by the Chinese Communists and the Japanese China Garrison Army commanders. 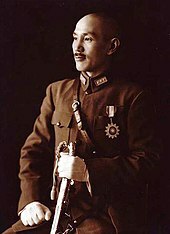 Due to constant Chinese attacks, Japanese Garrison Infantry Brigade commander General Masakazu Kawabe ordered Wanping to be shelled on 9 July. The following day, Japanese armoured units joined the attack. The Chinese 219th regiment staged an effective resistance, and full scale fighting commenced at Langfang on 25 July. After launching a bitter and bloody attack on the Japanese lines on the 27 July, General Sung was defeated and forced to retreat behind the Yongding River by the next day. On 11 July, in accordance with the Goso conference, the Imperial Japanese Army General Staff authorized the deployment of an infantry division from the Chosen Army, two combined brigades from the Kwangtung Army and an air regiment composed of 18 squadrons as reinforcements to Northern China. By 20 July, total Japanese military strength in the Beiping-Tianjin area exceeded 180,000 personnel. The Japanese gave Sung and his troops "free passage" before moving in to pacify resistance in areas surrounding Beijing and Tianjin. After 24 days of combat, the Chinese 29th Corps was forced to withdraw. The Japanese captured Beiping and the Taku Forts at Tianjin on 29 and 30 July respectively, thus concluding the Beiping-Tianjin campaign. However, the Japanese Army had been given orders not to advance further than the Yongding River. In a sudden volte-face, the Konoe government's foreign minister opened negotiations with Chiang Kai-shek's government in Nanking and stated: "Japan wants Chinese cooperation, not Chinese land." Nevertheless, negotiations failed to move further. On 9 August 1937, a Japanese naval officer was shot in Shanghai, escalating the skirmishes and battles into full scale warfare. The 29th Army's resistance (and poor equipment) inspired the 1937 "Sword March", which—with slightly reworked lyrics—became the National Revolutionary Army's standard marching cadence and popularized the racial epithet guizi to describe the Japanese invaders. The heightened tensions of the Marco Polo Bridge Incident led directly to full-scale war between the Empire of Japan and the Republic of China, with the Battle of Beiping–Tianjin at the end of July and the Battle of Shanghai in August. In 1987, the bridge was renovated and the People's Anti-Japanese War Museum was built near the bridge to commemorate the anniversary of the start of the Sino-Japanese War. There is debate over whether the incident could have been planned like the earlier Mukden Incident, which served as a pretext for the Japanese invasion of Manchuria. According to Jim Huffman this notion has been "widely rejected" by historians, as the Japanese would likely have been more concerned over the threat posed by the Soviets. Controversial conservative Japanese historian Ikuhiko Hata has suggested that the incident could have been caused by the Chinese Communist Party, hoping it would lead to a war of attrition between the Japanese army and the Kuomintang. However, he himself still considers this less likely than the "accidental shot" hypothesis, that the first shot was fired by a low-ranking Chinese soldier in "an unplanned moment of fear." In comparison to their Japanese counterparts, the 29th Route Army, and generally all of the NRA for that matter, was poorly equipped and under-trained. Most soldiers were armed only with a rifle and a dao (a single-edged Chinese sword similar to a machete). Moreover, the Chinese garrison in the Lugouqiao area was completely outnumbered and outgunned; it consisted only of about 100 soldiers. The Japanese China Garrison Army was a combined force of infantry, tanks, mechanized forces, artillery and cavalry, which had been stationed in China since the time of the Boxer Rebellion. Its headquarters and bulk for its forces were in Tianjin, with a major detachment in Beijing to protect the Japanese embassy. ^ a b c d Wang Yi (2004). 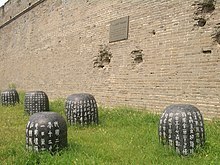 Common Knowledge about Chinese History. Hong Kong China Travel Press. p. 185. ISBN 962-8746-47-2. ^ "Qin Dechun". Generals.dk. Retrieved 14 May 2015. ^ "Marco Polo Bridge Incident", Encyclopædia Britannica Online . ^ The Soong Sisters, p. 229 . ^ Resistance and Revolution in China, p. 48 . ^ "Lugouqiao Incident", China through a Lens . ^ "Beijing: Its Characteristics of Historical Development and Transformation", Symposium on Chinese Historical Geography, p. 8 . ^ "Battle of Lugou Bridge", World War 2 . ^ A Companion to James Joyce, p. 202 . ^ "The Lukouchiao (Marco Polo Bridge) Battle", Colnect . ^ "76th Anniversary of 'July 7th Incident' Marked in China", Global Times . ^ Song, Yuwu, ed. (2009). "Marco Polo Bridge incident 1937". Encyclopedia of Chinese-American Relations. Jefferson, NC: McFarland & Co. ISBN 978-0786445936. ^ Usui, Katsumi (1981). "On the Duration of the Pacific War". Japan Quarterly. 28 (4): 479–488. OCLC 1754204. ^ Central Press (30 Jul 1937). "He Offers Aid to Fight Japan". Herald-Journal. Retrieved 2010-11-28. ^ "Marco Polo Bridge to Be Tourist Attraction : Chinese Spruce Up Landmark of War With Japanese". Los Angeles Times. 25 October 1987. ^ James L. Huffman (31 October 2013). Modern Japan: An Encyclopedia of History, Culture, and Nationalism. Routledge. p. 140. ISBN 978-1-135-63490-2. Dorn, Frank (1974). The Sino-Japanese War, 1937–41: From Marco Polo Bridge to Pearl Harbor. MacMillan. ISBN 0-02-532200-1. Dryburgh, Marjorie (2000). North China and Japanese Expansion 1933–1937: Regional Power and the National Interest. RoutledgeCurzon. ISBN 0-7007-1274-7. Wikimedia Commons has media related to Marco Polo Bridge Incident.